Bedbugs (Cimex Lectularius) are small parasitic insects, reddish-brown in colour and range from 1mm to 7mm in size. 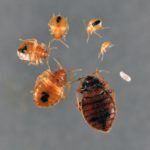 Although bedbugs feed on people’s blood there is no reason for concern as there is currently no evidence that bedbugs transmit any diseases. Bedbugs currently have become an increased problem in larger cities across the globe and everyone is at risk. 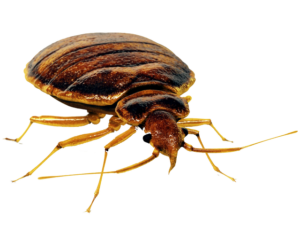 Bedbugs do not discriminate against race, age, economic status or cleanliness they are simply looking for their next meal. Bedbugs can’t jump or fly but are excellent hitchhikers that can cling to most surfaces and travel using clothing, furniture, suitcases and even on simple items. These simple steps can help prevent contracting and the development of a bedbug infestation. AVOID SITTING IN PUBLIC – Public transportation, Libraries, Malls, Restaurants, Health care facilities ext. are all places where one might contract bedbug activity. If possible avoid sitting in these locations. If you must sit be cautious and consider throwing all clothing in the laundry immediately after returning home. 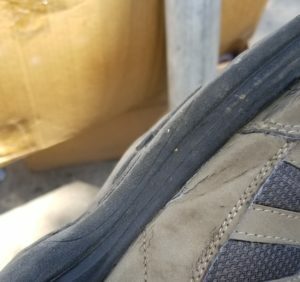 CLEAN REGULARLY – Most infestations begin very small with only one or two insect’s, which will take time to develop into a larger infestation. Frequently laundering bedding and vacuuming furniture can stop a new infestation before it has a chance to develop into an infestation. BEDBUG INTERCEPTORS & ENCASEMENTS – An effective way to protect your furniture and combat bedbugs. Bedbug interceptors also known as bed moats are double layered cups with a slippery surface that sit under the legs of your furniture. Using bed moats while also keeping your furniture a few centimeters off the wall and preventing sheets from dragging on the floor will keep bedbugs off your furniture, kill captured bugs and help with routine inspections. Mattress encasements are white sheets that completely encase your mattress or box spring. This prevents activity from nesting deep within, while also exposing all activity to the outer white surface where bedbugs and their droppings will be easier to see. ROUTINE INSPECTIONS – In the event that bedbugs do make it into your home catching the activity right away can mean the difference between a simple fix and a stressful battle. A good practice is to check your bed every time you remove your bedding for laundering. Start by checking the insides of your pillowcases around the seams and folds. Next fold back each piece of bedding layer by layer before removing. After the bed is stripped check the entire perimeter of the mattress under and around each fold for signs of activity. If the mattress is clear stand it up against a wall and begin checking the box spring (consider removing the underlining of the box spring as this provides a good hiding place for bedbug activity). Be sure to inspect the bedframe, headboard and any nearby furniture as well.